I was privileged to be a part of the Raymond Library Village re-dedication ceremony that occurred this past Sunday. I had a wonderful time listening to all the interesting stories of how a community came together to make a project happen so successfully. There is one story shared on that day, however, that has stayed with me all week and I have been thinking about it non-stop. I have been pondering his words of wisdom ever since and how it plays a role in my own life. I am very aware that I approach my own goals and dreams with a certain level of modesty, when in fact, thinking big is what I really should consider if I want to live the life I have imagined for myself. So I did a little research to discover why I think small and learned how I can turn that thought process around. We tend to think small due to the “voices of judgment.” Those voices either come from negative statements from others that point out every reason why we can’t do something and/or from our own inner voice telling us the same thing. Get comfortable with discomfort. Do something that you really want to do, you always have dreamed of, but felt like you should not do it for fear you could bomb badly. You might, but then nothing is gained if you don’t. Find supportive colleagues. Have people you trust in your circle – who not only cheer you on but can give you honest, constructive and wise feedback. Become the person others want to help. It is difficult to do it all on your own. Others can help you open the door to opportunity. To be the person others want to help, you have to be a positive influence, be reliable and follow through on your own commitments. 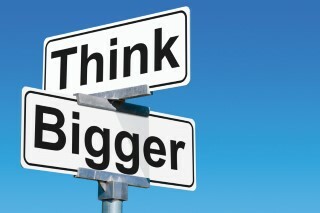 Clark gained his own insights from the book “The Think Big Manifesto” by Michael Port.